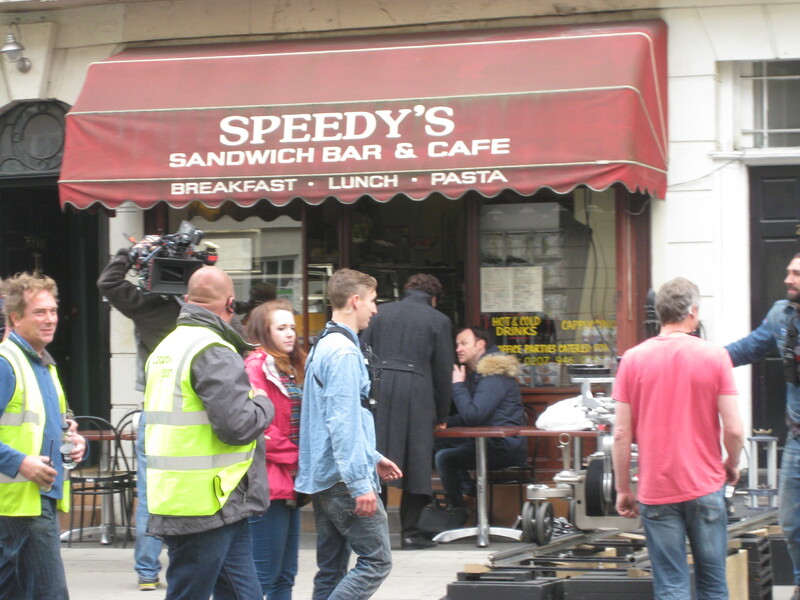 So Tuesday morning I started out heading back to Speedy’s and possible Sherlock filming. The signs posted as early as Saturday said no parking from 8:30 – 6:30, but no one knew when they would really be there. 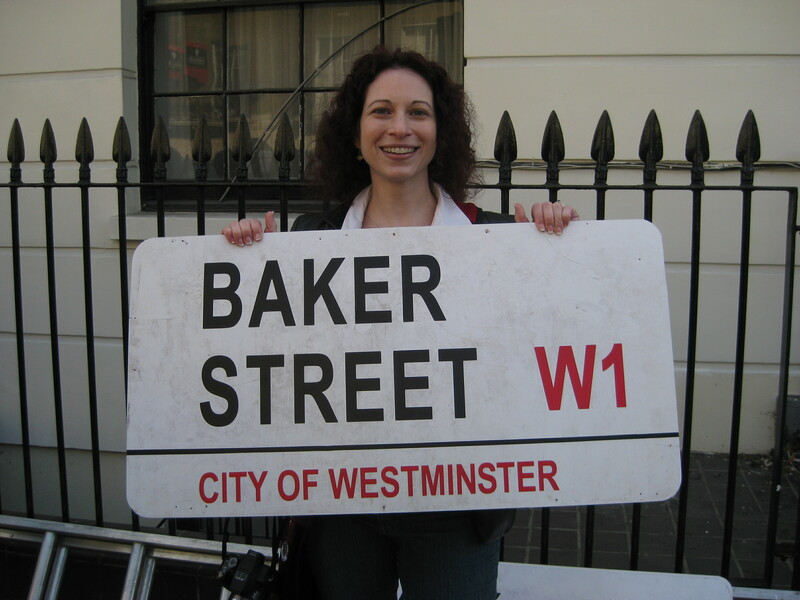 I found a few fans and some crew, who were already transforming the street into Baker Street, but no actual filming. 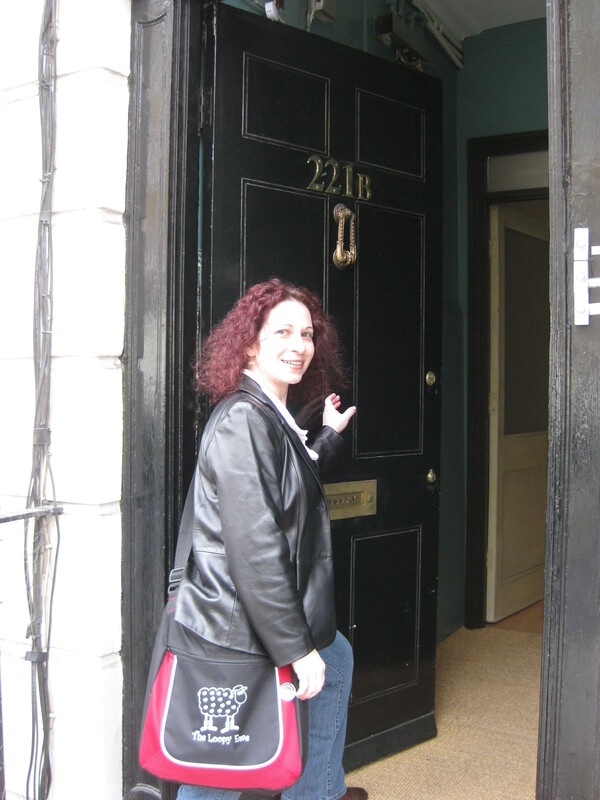 I got my photo in front of the newly renumbered door. 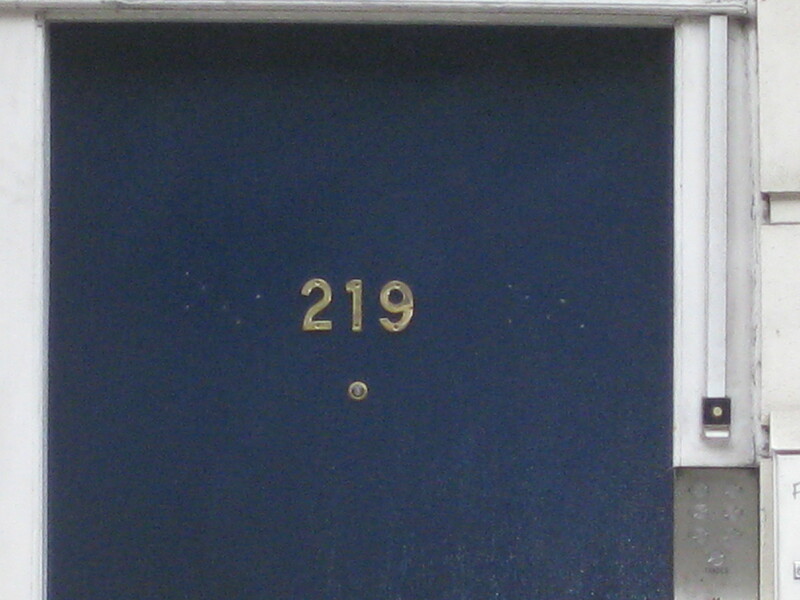 They renumbered the next door down as well. 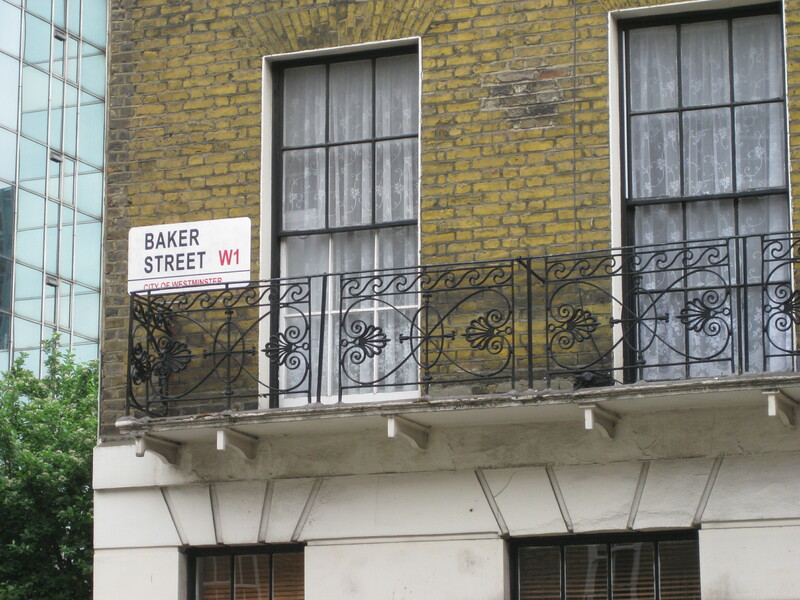 Since I only had a few days left in London, I didn’t want to spend it all standing on North Gower Street waiting for something to happen. I ambled down Gower Street to the British Museum, passing along the way the Darwin Building (the University College London buidling that stands on the site of a building Charles Darwin lived in), RADA, and Bonham Carter House. 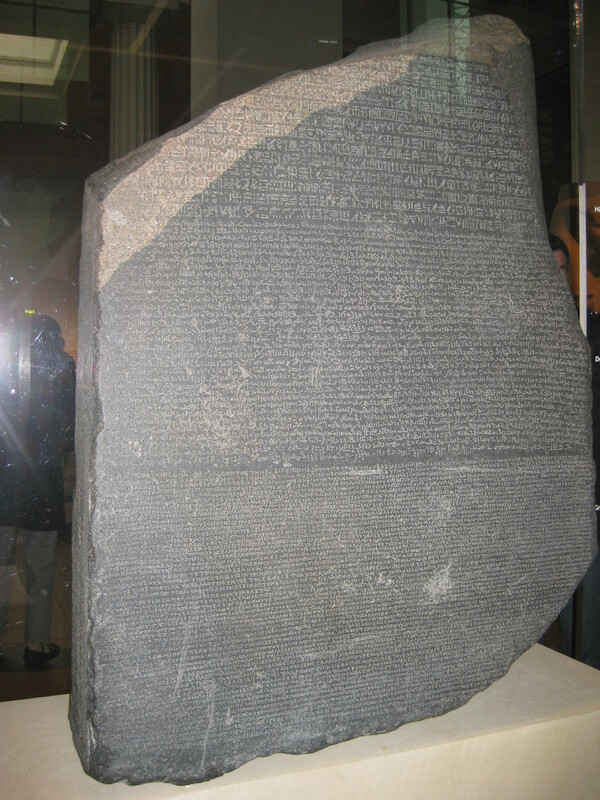 At the British Museum, I had to see the Rosetta Stone, though the area was really crowded. I managed to catch a little talk on their Japanese exhibits. They have a really lovely collection. My next stop was Highgate Cemetery. (Highgate Hill was the first real hill I’d encountered in London. Oof.) I only visited the East Cemetery. The West Cemetery is by guided tour only. 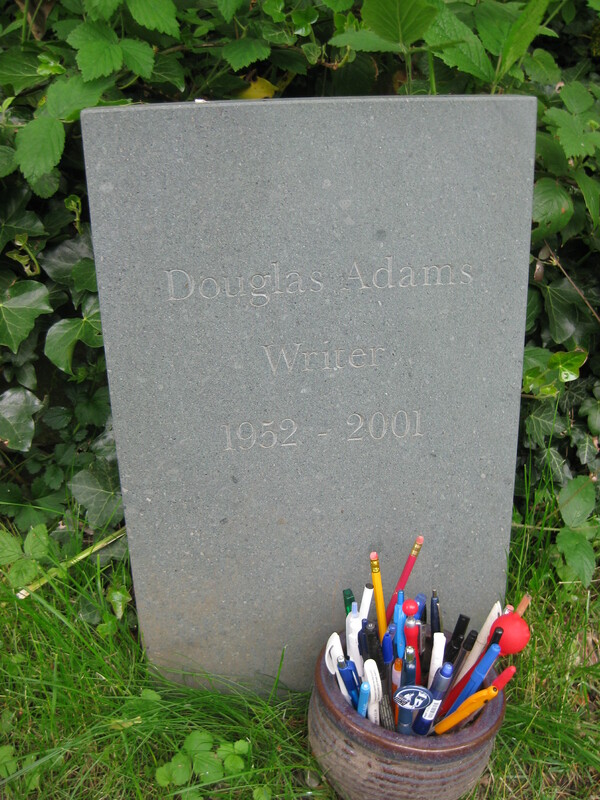 I went mostly to leave a pen at the grave of Douglas Adams. My pen’s the red one in the middle with the little ball on top. 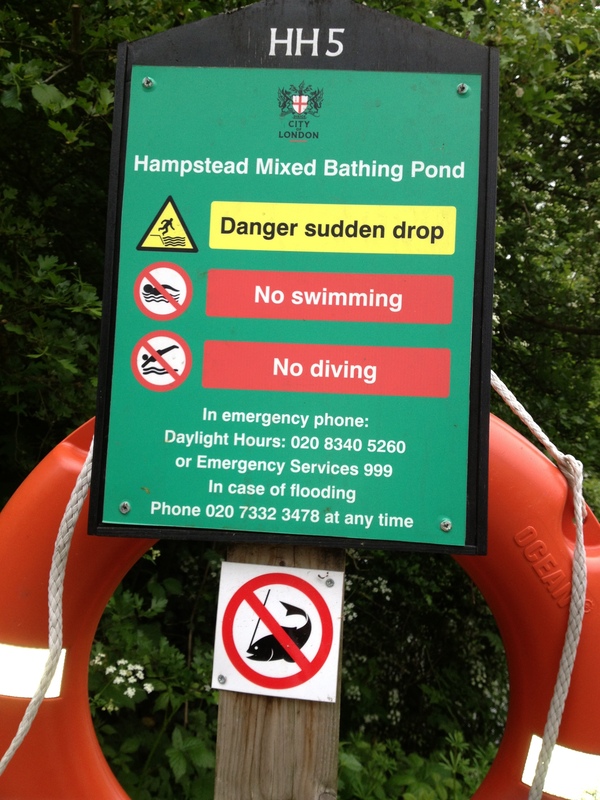 I then walked down to Hampstead Heath, through the Heath, and over to Hampstead High Street. That’s about 2 miles, and it’s a bit hilly. I didn’t have a great view of the city from the top of the hill in the Heath due to haze, but it was still pretty. 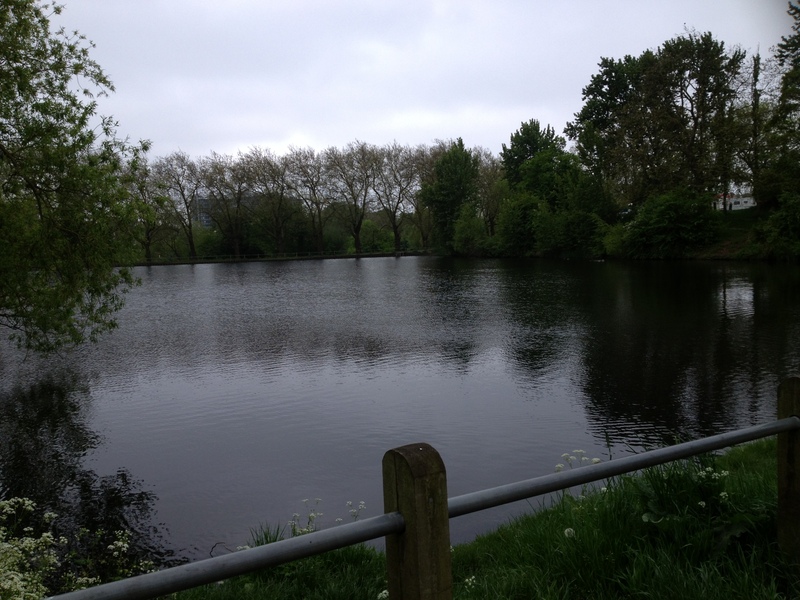 I got a peek at the ponds that Benedict Cumberbatch says he likes to swim in. Once I got to Hampstead High Street, I was definitely ready for some food and a drink. 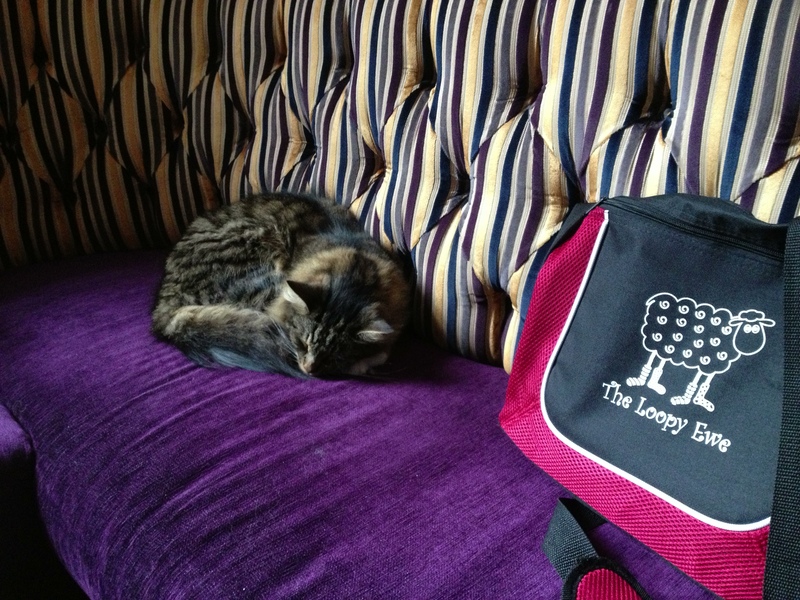 When I settled into a chair in the pub, I discovered that I wasn’t alone. After my meal, the cat deigned to let me scratch it behind the ears while I finished my cider. 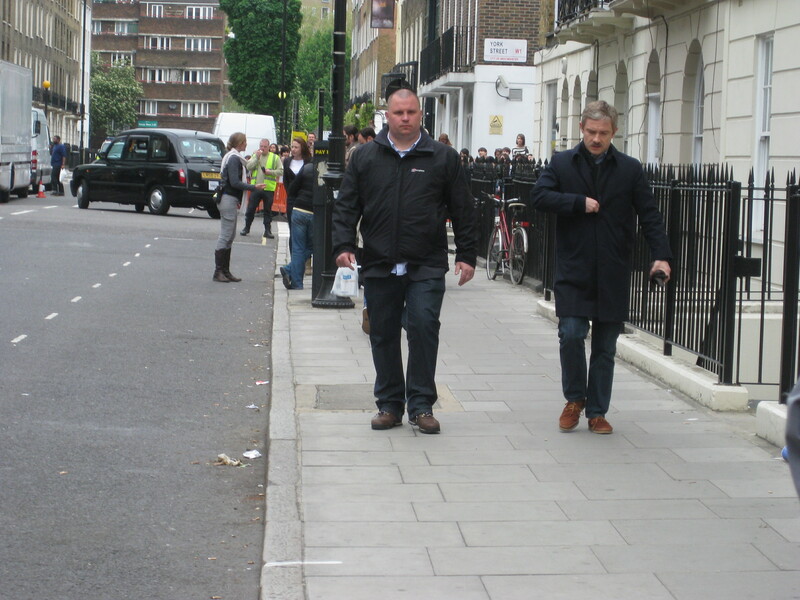 While I was eating, I got a message that Benedict and Martin, who had been filming earlier in St James’s Park, were now at North Gower Street. I arrived back there to find that once again, I wasn’t alone. Not that I’d expected to be! Looking to avoid that crush (I’m rather short), I ambled around the corner. 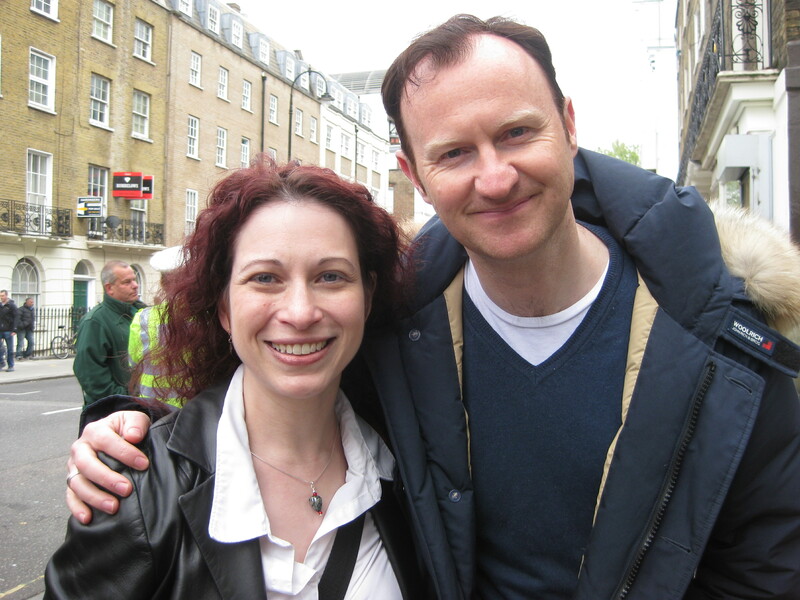 I had to keep moving, but I saw Benedict, dressed as Sherlock, talking to Mark Gatiss, who sat at one of Speedy’s outdoor tables. I wound up opposite Speedy’s and off to the left, if you’re facing it. 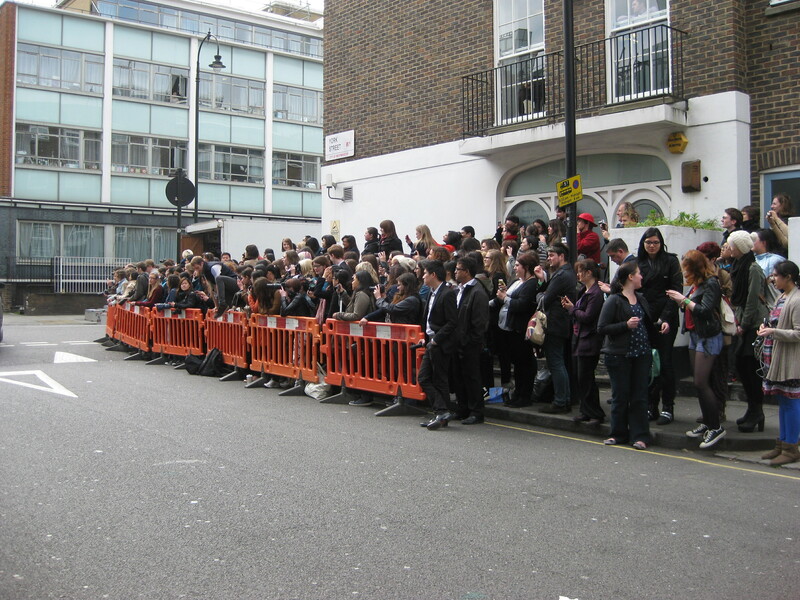 (The crowd behind the barricade was on the right corner, opposite Speedy’s.) There I bumped into @jappthebear’s human coffeebot, and we stuck together for the rest of the filming. 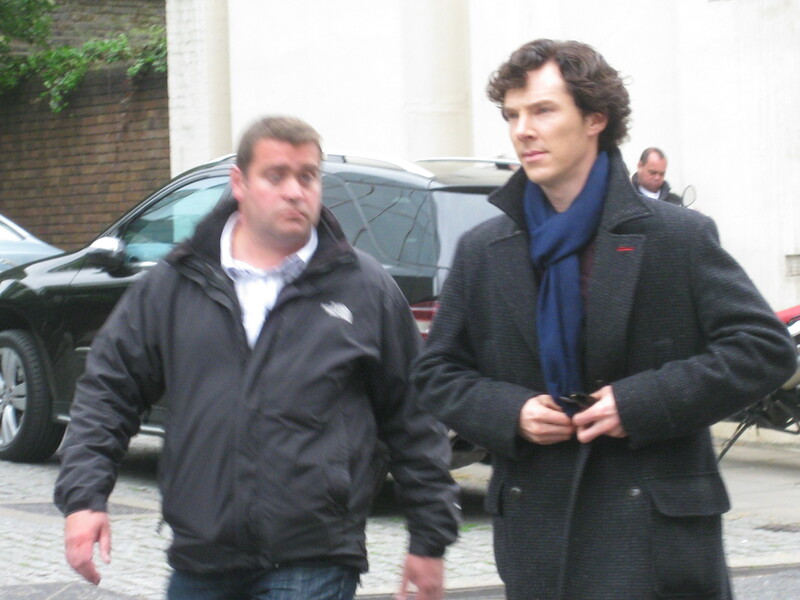 Not long after I arrived, Benedict left for the day, walking right past us. I got one good photo. Well, it’s not a good photo of his bodyguard…but who am I kidding? 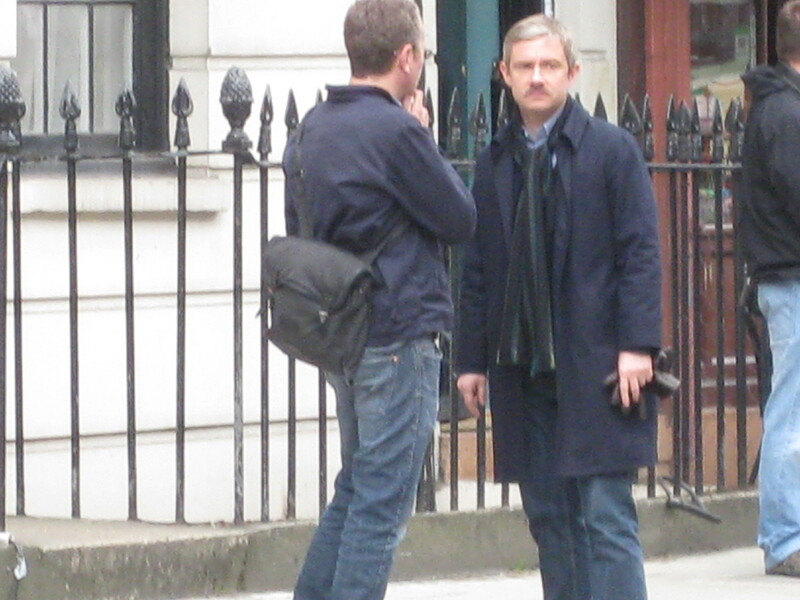 Filming continued with Martin, who was wearing a mustache. 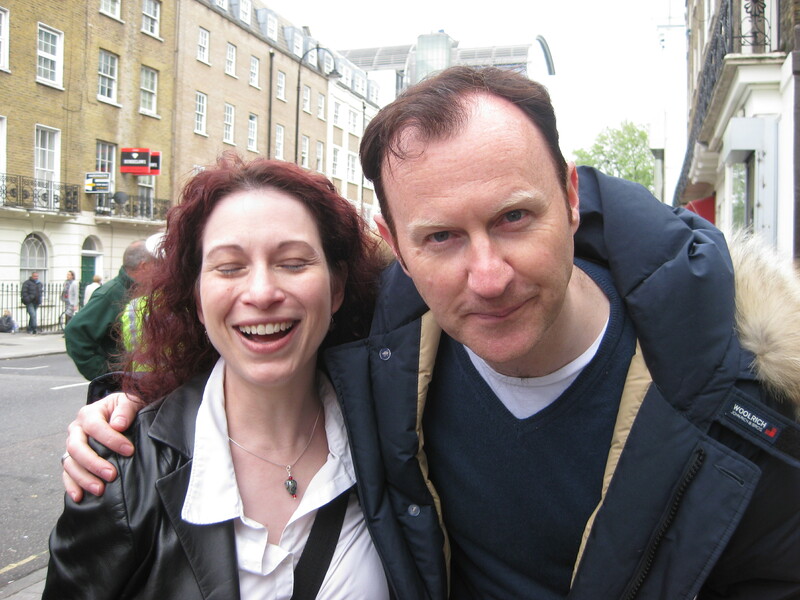 Mark Gatiss was there as producer, not as Mycroft. I know this has been said before, but there was a lot more waiting than there was filming. 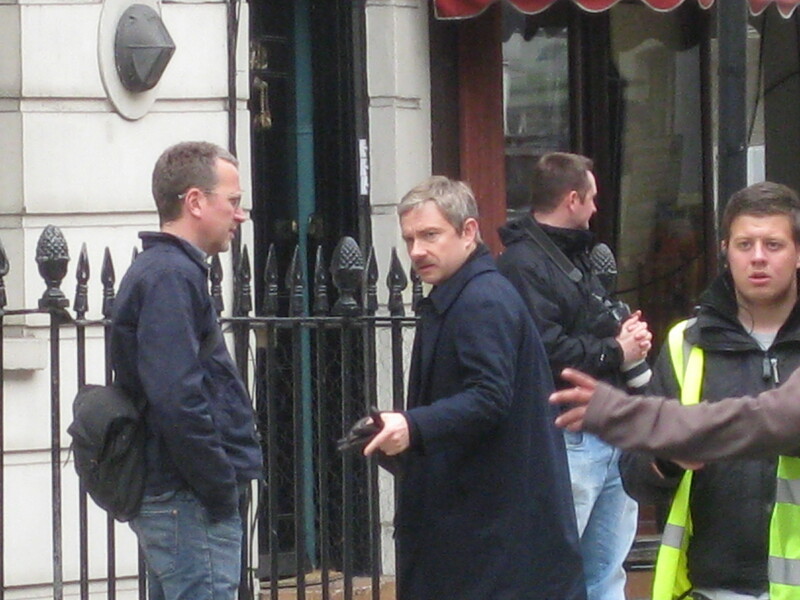 At one point, Martin walked past the small group we were in, and I didn’t take photos because I would have had a camera right in his face. Several of us said “hello,” and he said “hello, hello, hello,” as he went by, but didn’t stop. I have a lot of photos of him from pretty far away. Soon after, filming ended for the day. The crew started putting things to rights: taking down the fake street signs, putting Speedy’s neon sign back over the door of 187 North Gower, changing the street numbers back, and removing the fake “to let” signs across the street. 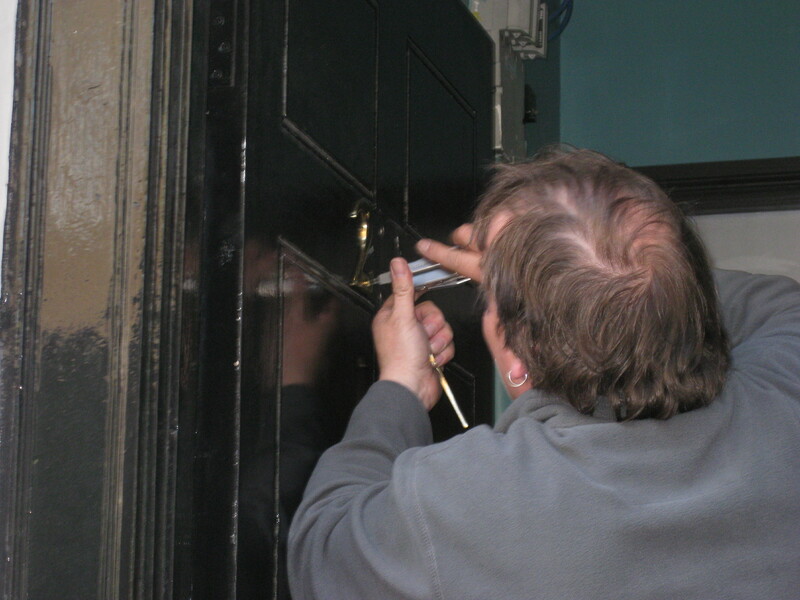 Much to our amazement, the door was open. 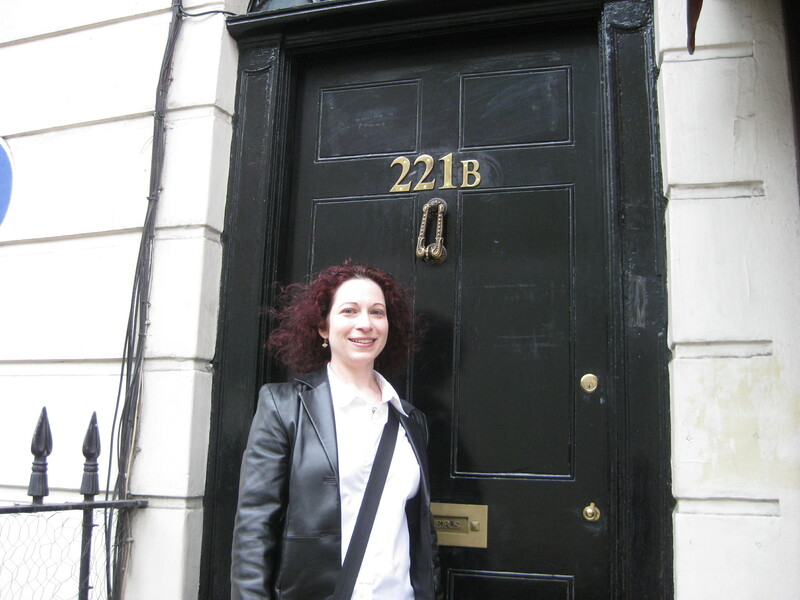 Forget the frizzy hair; look at the door! The street signs aren’t metal! The set crew were happy to let us take photos but were very careful to make sure none of us made off with one. I don’t think it would have fit in my luggage anyway. I heard a couple of the crew talking with amazement about the level of fan excitement. One was saying he’d never seen anything like it, even for a movie. 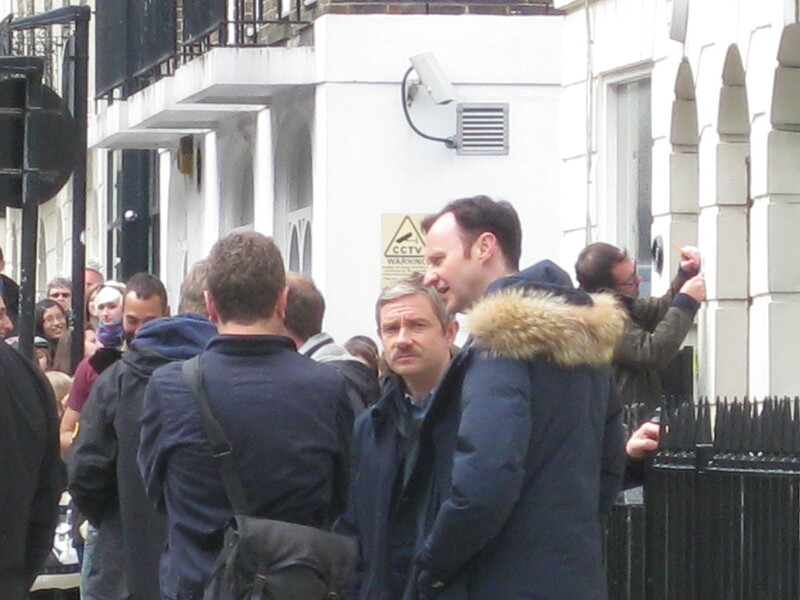 After all was said and done, we ran into @ruther2, who had been feeding some of us information (it was from him that I first heard that filming would happen on North Gower that Tuesday), but had been stuck at work and unable to make it there until the very end of the day. He invited a few of us out for a drink. @Jappthebear had to leave, so I bid her a fond farewell. Sitting in The Crown and Anchor (corner of North Gower and Drummond Streets) with @ruther2, @myanglofiles, and @_andy_tea, I realized that I didn’t want pub fare again, since I’d had lunch in a pub already. Communing with my taste buds, I decided I wanted sushi. A quick internet search turned up Atari-ya. According to my tube guide, I could get there in 20 minutes…and they closed in 30. Making my farewells, I decided to chance it. For the first time since I got to London, I ran up and down the escalators in the tube stations. I made it, with 5 minutes to spare. I was told with good humor that I was in time to order, but it had to be take-away. I got a negitoro entree and an eel avocado roll and brought them back to my hotel. Totally worth the effort of getting there. The next day, I went to the Fashion and Textile Museum to see the exhibit “Kaffe Fassett: A Life in Colour.” It’s a lovely exhibit, but it could be lit better. Then I went to the Wallace. I caught a wonderful talk about Sèvres porcelain – it was the docent’s first time giving that talk, and she went off on tangents about Madame de Pompadour that were very interesting and showed her love of the subject. I don’t think anyone minded that she ran over time. I spent a while communing with my good friend, “The Laughing Cavalier” (I have a painted copy in my home). Afterwards, I decided to rectify the biggest omission of my trip: I had not had tea. Unfortunately, the place I chose seemed a bit overpriced, their menu was not clear about what was included, and they were not overly friendly. It was, I think, the only really disappointing meal of my trip. Under the principle of not saying anything if I can’t say something nice, I’ll omit the name of the restaurant. At this point, I had pretty much covered everything on my list. I was a bit tired, and ready to go home. 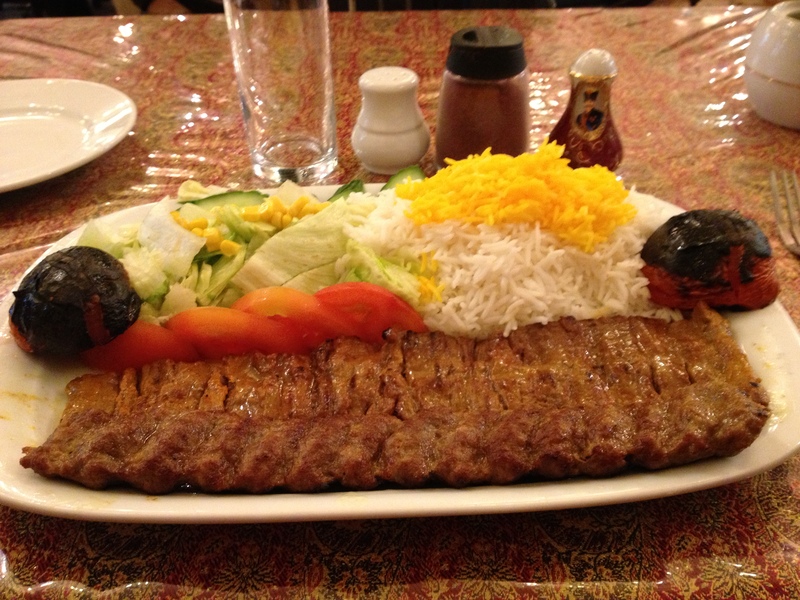 After returning to the hotel,packing, and doing a little local shopping, I went to a Persian restaurant about a block away for a late dinner. Mahdi was excellent. I didn’t know what to expect, and wound up having lamb kebabs, rice, grilled tomatoes, and salad. It was a lovely end to the trip. My flight back was uneventful. I watched Skyfall and Cloud Atlas (any theme there?) and knitted the whole way home. Philadelphia greeted me with heat, humidity, rain, traffic, and a sinus headache. Pretty typical. But it was good to get home and snuggle everyone who’d stayed home while I galavanted around London. 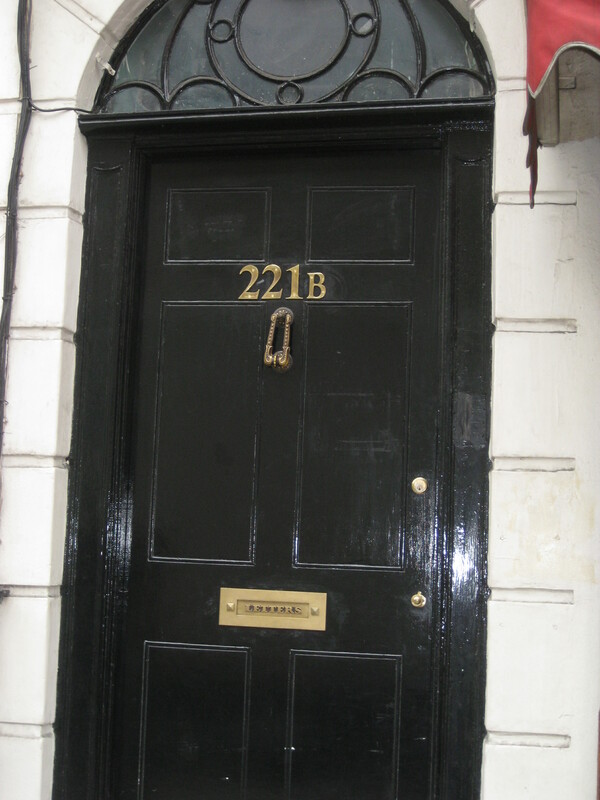 This entry was posted in Uncategorized and tagged 221B, Benedict Cumberbatch, Douglas Adams, Hampstead Heath, Highgate Cemetery, Kaffe Fassett, London, Mark Gatiss, Martin Freeman, North Gower Street, Sherlock, sushi, Wallace Collection. Bookmark the permalink.